In our outreaches towards the homeless in Sacramento, there isn’t a week that goes by without a run in and a friendly hug from Will and Barry. 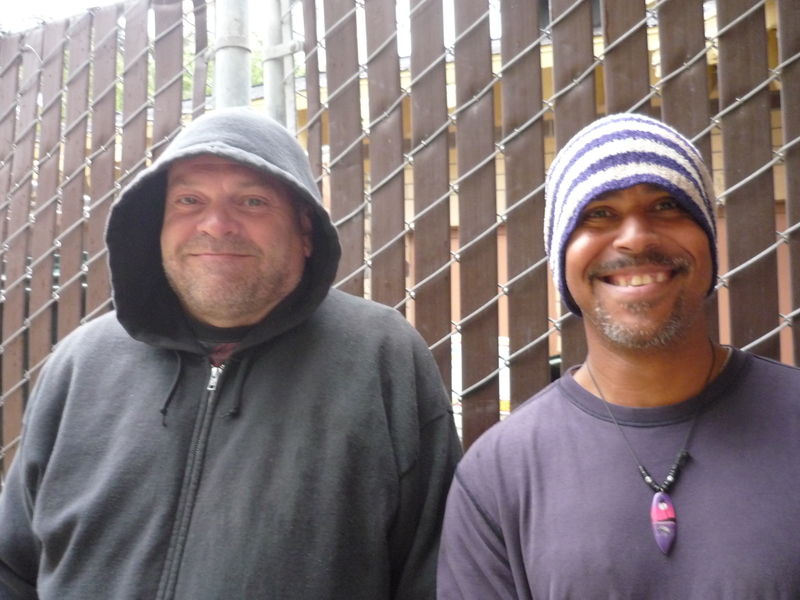 Will and Barry are homeless, they absolutely love Jesus, and they express that faith and love by volunteering full time in ministry serving the poor. I met Will and Barry at our community dinner and worship service at Cesar Chavez Park and after learning more about their lives I knew these were two men whose stories must be shared. Will Rivera grew up in Puerto Rico and moved to Sacramento in 1997 to be closer to his mom. He came to Christ in December of 2010, in a situation of immense need and desperation. In the months since then, God has made Will a completely new person. He spends over 40 hours a week volunteering his time at Loaves and Fishes, a resource center for the homeless. Will loves to uplift and show brotherly love to the guests at the shower house, where he distributes towels and runs the facility. He shares the gospel by using the clean towels to illustrate how God makes His children spiritually clean. Will’s favorite thing about serving the Lord is the peace and love that comes with it and the opportunity to help other souls come to know Christ. He strives to be a good steward of whatever God gives him, to stay in the Word, and to remain close to the Lord. Barry Trushel came to Sacramento on August 22nd, 2009 from Naples, Florida after God told him to relocate here. He got of the bus at 6:05 am and headed towards the Dream Center on C Street, convinced that this was where and how God wanted him to serve. Barry, too, used to work at the shower house, but now spends most of his time ministering in the park and handing out Bibles to the people he meets there. Barry’s favorite thing about ministry is changing people’s lives and being a vessel of the Lord. He shares that God often tells him where to sit downtown and shows him who to reach through his ministry. God provides him with food and clothes and pays for his phone bill. Barry wants people to know that true believing is being a servant and that learning to follow Christ is hands-on learning. After serving in Sacramento, Barry feels like God might be calling him to serve in Nairobi, Kenya.